Fasten the suction bracket to the reverse side of the monitor. Clean the surface where the suction bracket should be placed and fasten it properly to prevent the monitor from falling. If the camera is to be used with a FlexiPack/PowerBank battery, fasten the included magnet to the camera bracket. Make sure that the screws are not protruding from the magnetic surface. Connect the camera to the FlexiPack/PowerBank and place the camera and battery on the intended location. NOTE: The FlexiPack/PowerBank will start powering the camera immediately when connected. 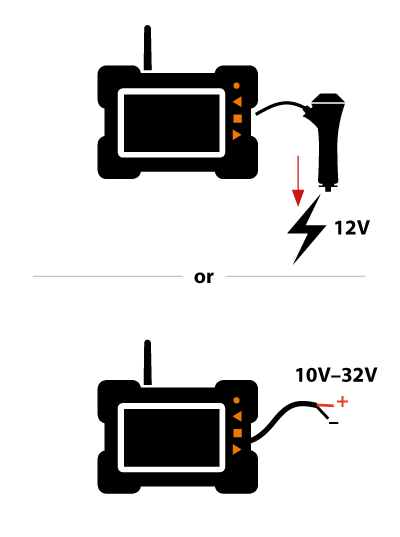 If left connected when not in use, the battery will become discharged.